so my computer has been off line for the last week. I hope to be able to catch up on my challenges and share them with you very soon. Enjoy the moments you find to tangle! Joey, I am so glad that you posted a challenge today in spite of the holiday!!! I went to another challenge site and there was NO challenge, thoroughly upset me. Today is a day off for me and I looked forward to both challenges. So thank you for posting your challenge. And ignore my asking you last week where your own last two tangles are, lol...moving an office is tons of work. Thank you for being here today...and always. Thanks so much for your comments Joyce! I do wish you had a means to share your art, I would love to see it! Ditto, Joey. Thanks for giving us a challenge to play with. Lori, I think your challenge is so beautiful! You were wise to not fill it in, it's perfect the way it is! Oh, I thought I lost this place (see my blog for the confusion), but glad I found it again! I used Phicops, Hurakan, Petal Ribbon and Quabog, and some black "stuff" in the fifth circle, accented by CO2, which are also little circles! I'm on a (circular) roll, as it were! Thanks! So glad to have your join in on the weekly challenges Antonine! Kristin, you have such a talent with those gelly roll pens! Every time I see one of your pieces I want to grab the glittery pens! Love the symmetry of your challenge this week Sal! And clever you to figure out how to make it work for the Diva's challenge too! Colette, I like how you have left the overlaps empty, it really makes the tangles in the circles pop. I like the web tangle too, maybe I'll use that for a Hallowe'en challenge?! 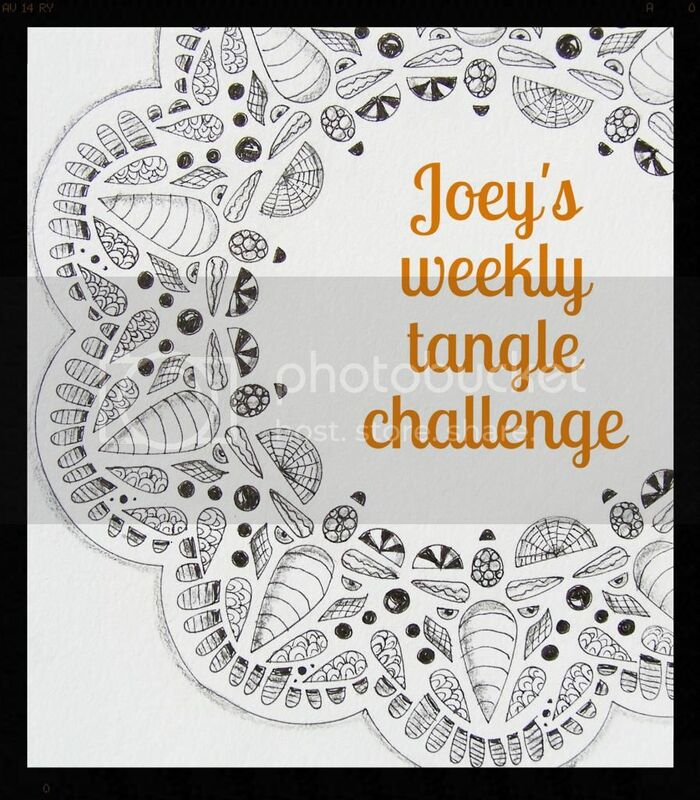 Joya, you have used so many great tangles in your challenge. I wish I could get my Zinger's to look like that! Kia, the placement of your circles looks as if they are bubbles falling from the sky! I like your choice of tangles too they go really well in a circular border! Ilse your artwork is so stunning, I love the circle in the bottom left corner, is that a tangle pattern? This was a great challenge, Joey. I thoroughly enjoyed doing it.